The Denver Nuggets captured their first playoff victory since 2013 on Tuesday with a 114-105 victory over the San Antonio Spurs. With the win, Denver evens up the series at one game a piece as both teams will be back in action on Thursday night in San Antonio. As far as tonight’s game goes, the Nuggets were looking to get off to a much better start offensively, which did not occur as they opened the game just 1-of-7 shooting from the field. Still, the Nuggets and Spurs were tied at six as neither team was clicking offensively early on. That was until Paul Millsap started to take over as he provided the Nuggets a much needed spark. Millsap had 11 of the Nuggets first 17 points as he was doing everything in his power to get Denver’s offense going. Even as Millsap was firing on all cylinders, the Nuggets offense was not as they shot just 8-of-25 from the field in quarter number one. Because of that, the Spurs held a 26-21 lead after one period of play as they were shooting a much more effective 10-of-21 from the field. It was not getting any easier for Denver though as San Antonio opened the second quarter on a 7-2 run, which gave them a 10-point lead with 10:45 left in the first half. San Antonio’s run would only grow larger as it reached 16-2 before five straight points from Nikola Jokic seemed to get Denver going again. Monte Morris added in a three-point play and Gary Harris made a three-pointer as the Nuggets were on an 11-0 run to cut their deficit to single-digits. That run was the spark Denver needed as everyone started to feed off each other, which led to some much more efficient offense by the Nuggets. In large part to their second quarter surge, the Nuggets only trailed 59-49 at halftime. Millsap still led Denver offensively with 15 first half points, while Jokic was also in double-figures with 12 points. Millsap and Jokic were the only Nuggets players in double-figures through two quarters as Gary Harris was the next closest with nine points. 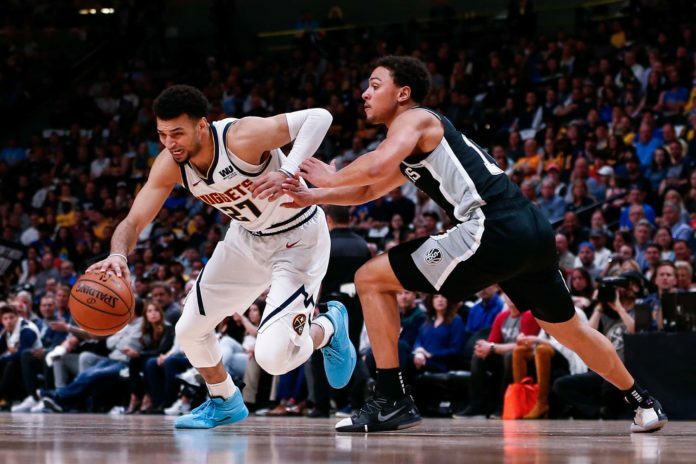 The Nuggets were looking to carry their momentum on into the third period of play, which they did by opening the half with a three-pointer by Harris. Denver’s offense quickly settled down though as the pace of play mellowed out, with each team either exchanging baskets or misses. That benefited San Antonio the most — considering they held the lead — as the Spurs still led by 10-points with 7:46 left in the third quarter. San Antonio only grew on that lead over the next couple of minutes as they opened the third quarter on a 14-8 run. Things were starting to look bleak for Denver as they trailed 73-57 with just under six minutes left in the third quarter. Luckily for the Nuggets, they had Harris, who was doing everything in his power to keep Denver in the game. A couple big shots by Harris led to a three-pointer by Malik Beasley, which all of a sudden made it a six-point game with 1:20 left in the third quarter. Denver ended up closing the quarter on a 16-4 run as they only trailed 82-75 going into the final 12 minutes of play. The Nuggets continued to play well as they opened the fourth quarter on a 6-2 run, which made it a one possession game. San Antonio was able to weather the storm for a couple of minutes, until Millsap hit a ridiculous and-one layup that made it a 95-92 game — in favor of the Spurs — with 6:49 to play. The Nuggets quickly went on a 7-2 run to take a 99-97 lead with 4:30 left in the game. Denver’s run was sparked by Jamal Murray, who was coming alive in the fourth quarter. After starting the game 0-of-8 from the field, Murray opened the final period 5-of-5 shooting as he played a major role in Denver’s comeback. Murray was just getting started as he drilled back-to-back three-pointers just a few possessions later to blow the doors open for Denver. The spark that Murray provided was all the Nuggets needed to pick up their first playoff victory in six years as they closed the final two minute of play in dominating fashion. Led by Murray, the Nuggets were able to pick up a 114-105 victory in a game they once trailed by as many as 19 points. Stat leaders for Denver were Jokic, who finished with 21 points on 7-of-15 shooting from the field to go along with 13 rebounds and eight assists. Millsap also had a big night for Denver with 20 points on an efficient 7-of-10 shooting from the field, while also hauling in seven rebounds. Other Nuggets who finished in double-figures were Harris (23), Morris (11), and Murray, who finished with 24 points on 8-of-17 shooting from the field and two three-pointers. Denver now has the day off tomorrow before they are back in action on Thursday in San Antonio. That game is set to tip-off at 7 p.m. MDT and will be televised on NBA TV and Altitude Sports.